series 101 Mach-One Pinstriping brushes by Mack Brush Company. This brush is based on an Old Grumbacher striper, although it has a differnet handle that is a little longer than the original. 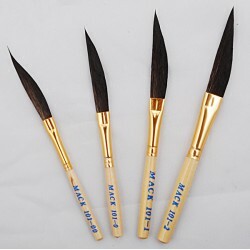 series 101 Mach-One Pinstriping brushes are for Pinstripers and Sign Painters across the world!. These brushes are for pinstriping, design and scroll work. This brush differs from the Original Mach-One is the handle which is no longer made with the Black Plastic, but a wood hande has replaced it and it works very well. series 101 Mach-One Pinstriping brushes have a single edge to pinstripe with, which is different than a pinstripers Dagger brushes which have two sides. Individual series 101 Mach-One Pinstriping brushes Listed Below!